A boy enjoying his summer vacation who was haunted by mysterious dreams. Soon his summer days started to crumble, along with everything he thought he knew about who he was. Roxas spent his time hanging out with his "best friends" Hayner, Pence, and Olette in Twilight Town, unaware that he was trapped in a digital prison and that none of it was real. He started having strange dreams of a boy he didn't know, and other weird events began happening around him as well. He encounters several Nobodies and discovers the Keyblade, which he is able to summon from time to time. A mysterious girl named Naminé also appears to him many times, apparently knowing things about him that he doesn't. A man in a black, hooded cloak also appears and another man wrapped in red bandages called DiZ. All of these people seem to know something about him, but he is unsure of their intentions. However, one man named Axel claimed that he knew Roxas and that he was under orders to bring him back. Roxas was able to escape him with the help of DiZ. In his dreams he also meets a girl named Kairi whom he recognizes as a friend of the boy in his dreams - Sora. More and more bizarre events take place leaving Roxas terribly bewildered and confused. Roxas questions are answered when Naminé reveals that he is living in a digital world and that he needs to merge with Sora because he is his Nobody. Axel reappears with new orders to eliminate Roxas if he refuses to go with him. DiZ intervenes again, and Roxas runs to the abandoned mansion where he finds Naminé. She informs him about Organization XIII and also reassures him that reuniting with Sora will make him whole. DiZ cuts off her explanation and takes her away, but not before she promises Roxas that they will meet again one way or another. Roxas searches around the mansion and finds that Naminé was right; the life he had been living was a lie. Roxas meets Axel once again, but he remembers everything this time. However, Axel says it is too late and Roxas prepares to fight him once more - this time with his true power and defeats his old friend using his two Keyblades, forcing Axel to retreat. Roxas finds the room where Sora, Goofy, and Donald were sleeping in special pods. DiZ appears and tells Roxas of his plans, mocking him. Enraged, Roxas attacks DiZ who turns out to be a hologram that disappears as soon as the central pod opens to reveal Sora. Roxas accepts his fate and merges with his original self saying that his summer vacation is over. 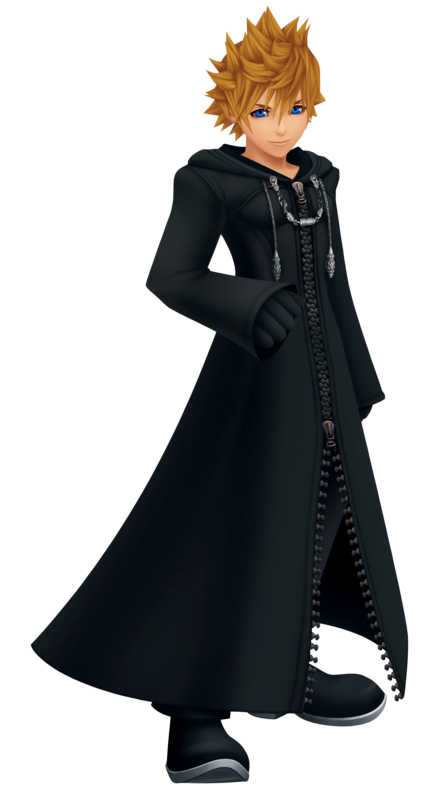 Roxas is later revealed to be Number XIII of the enigmatic Organization XIII through several hints and events in Sora's journeys. The two finally meet when Sora fights Roxas in his mind at the Station of Serenity. Roxas initially has the upper hand, but Sora wins the battle in the end and Roxas drops his hood, revealing his face and tells Sora that he makes a good "other". Sora finally understands when he is reunited with Riku who explains that Roxas is his Nobody which is also why he could wield the Keyblade. Sora is shocked at first, but remembers turning into a Shadow for a short time when he rescued Kairi. Riku further explains that Roxas had left the Organization because he wanted to meet Sora, although he wasn't aware of this at the time. He tells Sora that he fought with Roxas so that he could bring the Nobody to DiZ, realizing now that he didn't have to. Roxas and Naminé are able to fulfill their promise after Xemnas was initially defeated. They project themselves through Sora and Kairi and are happy that they met their original selves and became whole. After a promise from their "others" that they would always be together so that the two Nobodies could be together as well, they say their last goodbyes and merge again with their original selves. Roxas is seen again at the end of the game when Sora and Kairi are reunited at Destiny Islands, smiling at Naminé while their "others" do the same. 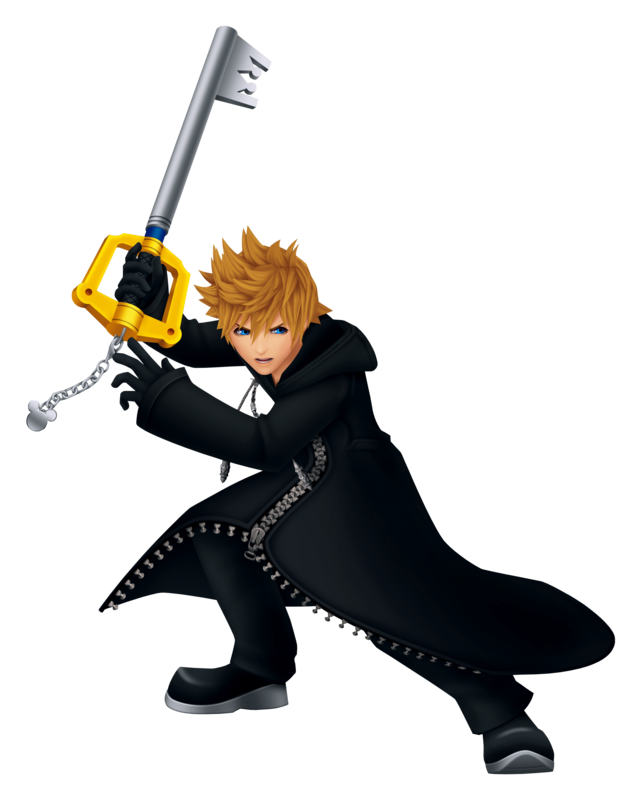 Number XIII of the Organization, Roxas is the Nobody of Sora, the Keyblade Wielder. He wields the same Keyblade as Sora yet unlike the other members of the Organization, Roxas lacks his Memories from before he became a Nobody. He undergoes training along with several members of the Organization and is introduced to his mission in the Organization - to collect Hearts using his Keyblade to form Kingdom Hearts. Roxas ends up befriending Axel, the fiery Number VIII. The two meet daily on top of the clock tower in Twilight Town and share sea-salt ice cream after each day's mission. As Axel is sent to Castle Oblivion before long, however, Roxas is left to perform missions with Xion, the XIV member who joined a week after Roxas did. Several days later Roxas falls into a coma, one he wakes up from about a month later. He dreams of a boy in red disappearing into a white pod, and from that point on, Roxas sees the boy in different times and places as though experiencing the boy's Memories. A couple of weeks after Roxas wakes from his coma, Axel makes his return and the two set out to look for Xion who's been missing since Roxas woke up. As Xion lost her Keyblade, Roxas agrees to work alongside her on her missions so that no one'd be the wiser about her situation. Not too long after she regains her ability to wield, however, Xion goes missing again and Roxas and Axel look for her. They head out to Castle Oblivion, yet there Roxas is overwhelmed by Memories and is dragged away into Twilight Town by Axel. They find Xion there yet in order to bring her back, Axel fought her. Roxas as a result begins to doubt him, being unable to believe Axel resorted to violence - they're all supposed to be best friends. There had to have been another way. In need of answers, Roxas seeks Xemnas and learns of Sora, and that he is how Roxas and Xion are related. Satisfied for the time being, Roxas returns to his duties yet refuses to even look at Axel. The next time Roxas dreams he sees a time when Sora lost his Keyblade to Riku, and wakes in tears only to find his own strength greatly diminished. Xion at the same time grows in strength, and the Organization pit the two against each other. Axel manages to save both, but the Organization is obviously not to be trusted. It is under these circumstances Roxas has to deal with the fact Xion went missing again, and that Axel let her. It turns out Xion is a Replica, placed next to Roxas to copy Sora's powers. With no Memories of his past to provide him with answers no one around him is willing to offer either, Roxas fights his way out of the Organization in order to find the truth about himself and his Keyblade. He finally finds his answers as he's forced to battle and defeat Xion who was sent after him by the Organization. He regains everything the girl took from him, yet at the same time begins to lose his Memories of her. He is left with a request to free the Hearts they captured, yet before he can try and fulfill that wish he is confronted by Riku who came to bring Roxas back to Sora. Even with two Keyblades at his disposal Roxas loses to Riku's Darkness and is forced to let go of everything - his Memories of Xion, his friendship with Axel, and even his own self as he returns to being part of the person he came from. Utilizing both a formidable weapon as well as decent magical powers, Roxas is a jack of all trades yet an ace of none. This is nothing to be looked at as a disadvantage however as with all his traits being equally balanced, Roxas has the ability to live through quite a few battles. He also shows this balance when he uses his Limit Break, the Event Horizon as he unleashes a series of fast paced, hard hitting strikes. His Element of the Light comes into play, as pillars of light scatter away from him, annihilating anything in their paths. A rather interesting bonus is offered in Mission Mode, utilizing the Zero Gear. With three Ability Units equipped, Roxas becomes a fast paced killing machine as he duel wields both the Oathkeeper and the Oblivion. In that state, Roxas seemingly sacrifices power for the sake of speed but not only is he still hitting hard, but also faster, making for more damage in the long run. His finisher combos become areal attacks, and his Limit Break, Magic Hour, is something to look out from. While floating in the air, Roxas summons numerous beams of light to crush down on his foes, dealing massive amounts of damage to all enemies within a wide range. Gazing out towards the horizon with sea salt ice cream in hand. An act done countless times over, but one that Roxas would not hesitate to do again and again with his best friends Axel and Xion with him side by side. He hesitates for a moment and gazes out into the sunset, as if he notices something. With the setting sun fading in the distance and the multicolored sky looming overhead, he has but a single word to say. The familiar name of his other - Sora. 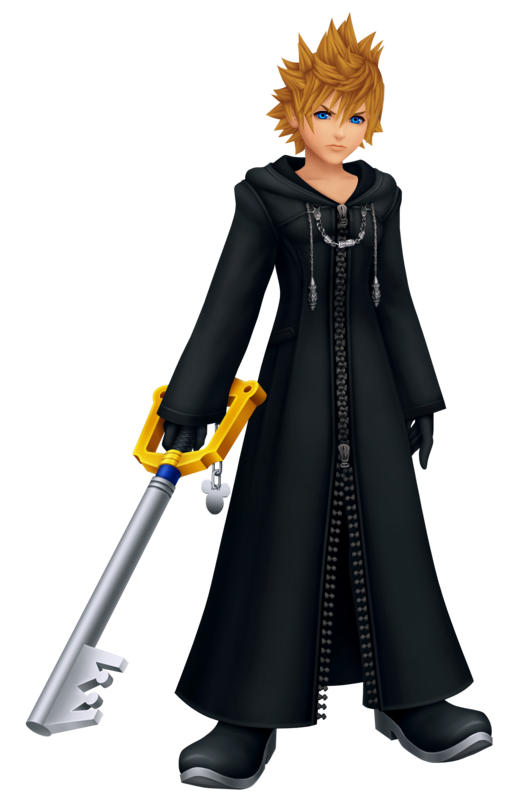 Born when Sora stabbed himself with the Keyblade of People's Hearts in Hollow Bastion during the first adventure, Roxas is Sora's Nobody; number XIII of Organization XIII and an accomplish Keyblade wielder in his own right. He quit the Organization in order to learn more about his origins, and has since reunited and rejoined with Sora. However, surely there must be a part of him who yearns to be his own person once again. Sora chases a figure in a black coat through the forgotten streets of the Dark City, believing it to be the black-haired girl he saw earlier. To his surprise, it was Roxas. He told Sora that it could have been him in his position, but only Sora would be able to accomplish that goal. Sora didn't understand, and instead told Roxas that he deserves to live his own life separate from Sora, like he did so long ago; they're not one in the same. But that only reinforced Roxas' statement and taking his hand, he let flow all the emotions and memories he kept inside; the happiness, the laughter, the grief he shared with his friends, and he disappeared. Roxas appeared to Riku within the depths of Sora's heart to ask him one question: "What is it that you're so afraid of?" Satisfied with the answer, he vanished.